Beach wedding flowers do not have to break your budget. Save money on your cheap Florida Beach wedding with some simple flower strategies. 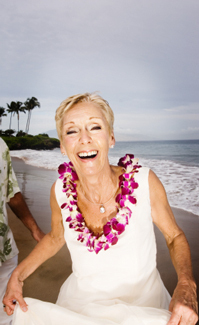 Flowers for your Florida beach wedding can easily become a major expense. However, with a little awareness and some simple planning. You can cut hundreds...maybe even $1000 dollars on this aspect of your special day. * Heat, humidity, and wind can put flowers into major distress. Why pay hundreds of dollars for wedding flowers that will wilt quickly? * Holding a bouquet on a warm day is distracting. You do not want to take attention away from the minister and your beach wedding ceremony. * Consider real leis for yourself, the bridesmaids, and a FEW special members of the ceremony. For all others, silk Maui Leis work fine. * Shop around. Go to at least five different places. Flower shops are really feeling the pinch of the economy. Use this to your advantage. Strive to get the best price possible for the best quality of flowers. * Do NOT be afraid to say what a competitor's shop is offering. Save even more money with positive negotiating. Always start negotiating from a 30% reduction. If you can get 25 percent off the cost of your flowers, you are doing great. * ALWAYS ask if they can "throw in some silk flowers." You can find cheap beach wedding flowers, but it will take you some time. Start early. Always get a signed final offer. Walk away if you are being made to feel guilty for negotiating. This is YOUR Florida beach wedding and the money saved is money that can be used later in your new marriage.